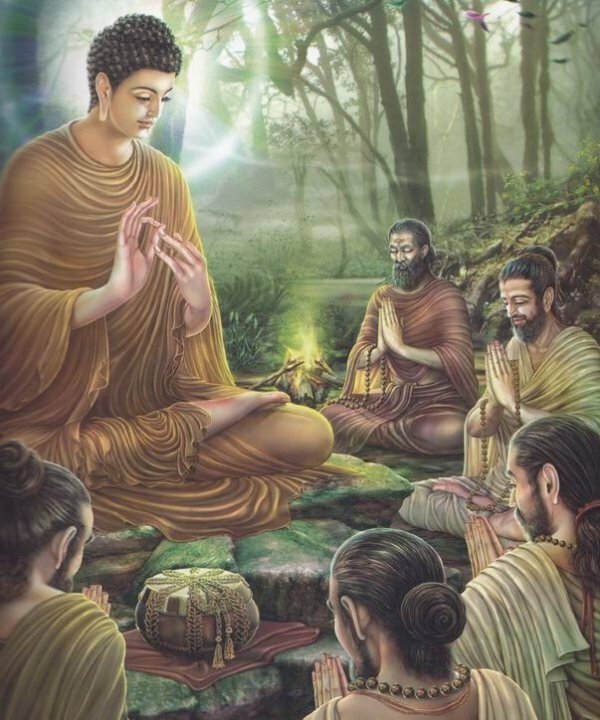 In past, present and future time, today, this new moon, falls two weeks before the great event that set Buddhism into motion in the Indian month of Vesak 2600 years ago, the Buddha's Enlightenment or Buddha Jayanti. Still immersed in ascetic practice, the life in his body nearly destroyed with it; this moon comes before the Bodhisattva's turning intuition of the Middle Way, before his fellow ascetics' abandoned of him, before his final bought with Mara, before seeing the morning star, touching the earth and realizing the complete end of all suffering. "My body became extremely emaciated. Simply from my eating so little, my limbs became like the jointed segments of vine stems or bamboo stems... My backside became like a camel's hoof... My spine stood out like a string of beads... My ribs jutted out like the jutting rafters of an old, run-down barn... The gleam of my eyes appeared to be sunk deep in my eye sockets like the gleam of water deep in a well... My scalp shriveled & withered like a green bitter gourd, shriveled & withered in the heat & the wind... The skin of my belly became so stuck to my spine that when I thought of touching my belly, I grabbed hold of my spine as well; and when I thought of touching my spine, I grabbed hold of the skin of my belly as well... If I urinated or defecated, I fell over on my face right there... Simply from my eating so little, if I tried to ease my body by rubbing my limbs with my hands, the hair — rotted at its roots — fell from my body as I rubbed, simply from eating so little..."
It is a common and much glorified theme; this tendency to go to extremes. Believing that either we can find lasting happiness and satiate our craving and the hunger that burns inside us through the indulgence of our passions in sensual and intellectual pleasures and the securing of them, or that we need to punish ourselves (and others) somehow for known or imagined sins and faults -- either from the past or somehow essential to our nature -- in order to be pure and clear, clean and holy - to live a life of lasting safety, security, peace and happiness, or for there to be such after death. According to the stories, the bodhisatta's body had shriveled, bones showing through skin like rafters, eyes sunken in sockets like water in deep pools, birds nesting in hair that was falling from the roots. And yet he had not found the way. Until, sitting there by the river, a boat floated slowly by with a teacher and student of the lute inside - the student learning the tuning of the lute - its strings needing to be not too tight, not too loose, in order to be in tune. Not too tight; not too loose. The Buddha was to later repeat this teaching we know not how many times, or in how many ways. We find it recorded as spoken to Sona in the Anguttara Nikaya and in the section 34 of the Sutra in Forty Two Sections. He went down to bathe at the river for the first time in years and accepted an offering of meal of milk rice from a local girl. His monastic companions, thinking he had abandoned the ascetic path, abandoned him. Refreshed, he found a seat beneath a great pipal tree -- the ficus religiosa or "tree of wisdom" -- and sat down beneath it on a seat of fresh cut kusa grass offered him by a buffalo boy. And his memory returned to the time when he himself was just an eight-year old boy sitting underneath a jambu - rose-apple tree -- the tree of life -- and fell into deep and rapt meditative absorption. There are different ways of paying back and paying forward in this world. It has often amazed me jumping ahead in this story -- as we know that the once emaciated and unsuccessful ascetic is soon to become buddha - Awake and an arahant or Successful One -- that the Buddha's first thoughts of compassionate sharing were for his teachers (who had taught him ineffective meditative means) and for his former companions who had left him. For after well reviewing what he had realized, and spending time in its enjoyment, it is those former companions whom he first set out to meet. No ill-will remained in him regarding whatever their thoughts and behavior to him in the past, but just the knowing of the ripeness of possibility for liberating transformation, this being more valuable and worthy than all other things to the enlightened mind. ...Bhikkhus, without veering towards either of these two extremes, the Thus Come One has awakened to the Middle Way, which gives rise to vision, which gives rise to knowledge, which leads to peace, to higher knowledge, to full awakening, to Nibbāna. Not a middle way divorced from our natural abilities as human beings, but present in the beautiful capacity for joyful and rapt absorption of a child, skilfully applied and directed, with wise attention. Of course this Middle Way that he ended up teaching, although still including deep and rapt meditation sitting beneath all kind of trees, included far more than that. Starting with the mind and our views and intentions, it flows into and informs our thoughts, worlds and deeds, and our whole way of life, with mindfulness and rightly applied effort touching new life and awareness into every facet of our experience and being. It was the awakening of the intuition and known and felt sense of the middle way that sparked it all; so much latent virtue and accumulated merit, ready to be well-applied, with just the right idea and intention, developed fully, then coming to its natural and full fruition.